With the Eindbazen CTF team, we hosted the CTF (ebCTF) during the hackers event OHM2013. 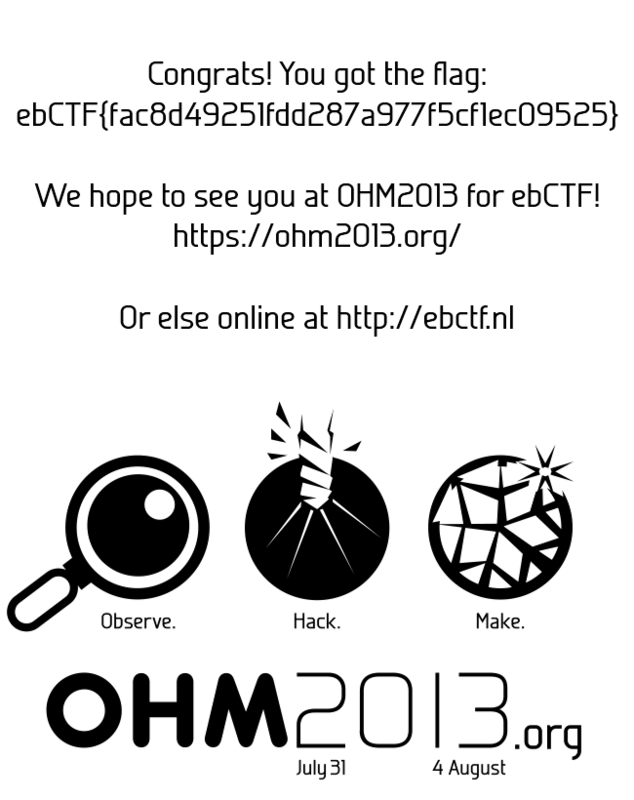 To generate some awareness about the CTF and OHM2013 event we also held a Teaser round some time before it. Besides full-filling an organizers role I also created multiple challenges for both the teaser round and the CTF. For the teaser round I created the challenges BIN100 and FOR100, and for the main CTF I created the challenges BIN100 (together with asby), BIN200, BIN400 and NET400 (together with the NFI). This write-up contains the solutions, background info and source codes of the challenges I have worked on. Feel free to use anything from this write-up including source codes, as long as it is for non-commercial usage and please provide credits were appropriate. For commercial usage, please contact me to discuss. Beat our dice game and get the flag. The dice throws seems to be done at random, so we do not have much chance of winning this game. 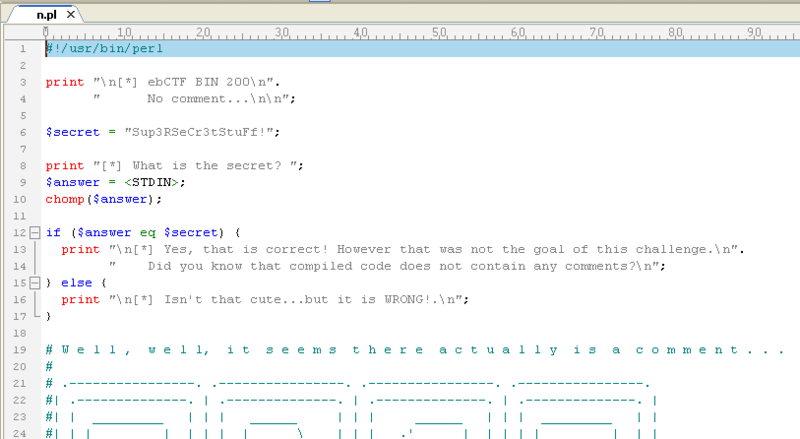 What we can do is cheat by adjusting the code in OllyDbg. However we might want to avoid debug checks, because one of the things we should note is the calls to certain timing functions in the executable. 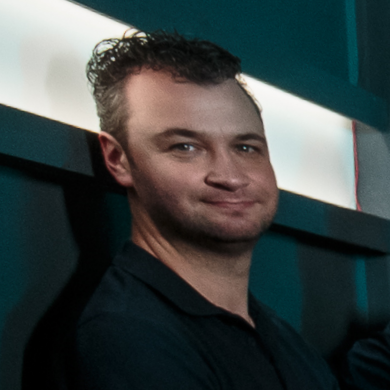 When we now run the code outside of OllyDbg, we will get the flag. Note: When you run the code inside OllyDbg or patch the code live during execution it will most likely not result in the (correct) flag. One of the ideas behind this challenge was to give the wrong key when people were running the challenge inside a debugger. Both a isDebuggerPresent routine and multiple timing checks were done during the execution of the code. When any of these checks failed the XOR-key which was used for the decryption of the flag would be changed so the flag would never be correctly decrypted. The idea about this challenge was to make a statement about far-fetched unrealistic Forensic challenges which often appear during CTFs. But to keep it fair we would give the solution with it as well. The file we end up with seems to be the following PNG file. To get to the 7zip file we use the dd tool and skip the first 10388 bytes (0x000195d0 as in the screenshot above). Now we can unpack the 7zip file, however it is also password protected. The password can be cracked and is “21”. From the 7zip file we got the file ebCTF-Stego_is_NOT_forensics. Did you know ebCTF will take place from August 2 till August 4, 2013? Better put that in your calendar! The name of this next step seems to be a link to the LSB-Steganography Python software found on github. You showed your Windows debugger skills during the teaser, but how good are your Linux debugger skills? BIN100 of ebCTF was a joint effort of asby and me, it was the Linux version of BIN100 from the ebCTF Teaser round. Basically the code was the same with some minor changes. root@bt:~/ebCTF/bin100# ./bin100 [*] ebCTF 2013 Teaser - BIN100 - Dice Game To get the flag you will need to throw the correct numbers. [*] You will first need to throw a three, press enter to throw a dice! ------- | O | | O | | O | ------- [*] You rolled a three! Good! [*] Next you will need to throw a one, press enter to throw a dice! ------- | O | | O | | O | ------- [*] You rolled a 3 That is not a one :/ [*] Game over! To get the flag you will need to throw the correct numbers. [*] You will first need to throw a three, press enter to throw a dice! [*] You rolled a three! Good! [*] Next you will need to throw a one, press enter to throw a dice! warning: the debug information found in "/lib/ld-2.11.1.so" does not match "/lib/ld-linux.so.2" (CRC mismatch). There should be something hidden in this file, can you find it? Sadly enough between the creation (and testing) of the challenge and the usage of it during ebCTF someone created a Python script which made this challenge much easier sadly enough. It was not the goal of this challenge to just run a tool against the file and get the flag. The reason the key was added in ASCII art instead of plaintext was to make sure it would not be easy to just find the key somewhere in memory when executing the program. print "\n[*] ebCTF BIN 200\n". print "\n[*] Yes, that is correct! However that was not the goal of this challenge.\n". # W e l l , w e l l, i t s e e m s t h e r e a c t u a l l y i s a c o m m e n t . . .
# .----------------. .----------------. .----------------. .----------------. http://nopsrus.blogspot.nl/2013/08/ebctf-bin200-200-points.html (great write up which shows how to use IDA to solve this challenge). NOTE: The goal of this challenge is NOT to attack this webservice, this is NOT a WEB challenge. When we compile this source code and then add the collisions with the Perl script we end up with 5 executables. The Eindbazen ‘Forensic Unit Computer Knowledge & Advanced Persistent Threats’ and the ‘Special Unit Cracking Kiddies Investigations Team’ are currently investigating a new Scriptkiddie Group working under the name of ‘The Figuurzagers’. This team is suspected of hacking various crappy protected environments to place flags on these systems. The NFI provided us with a network tap of one of the attacks. Could you recover the flag for us? I wrote the scenario and the last part of the NET400 challenge, which was further created by the Dutch Forensic Institute (NFI). For the first part of the challenge I have to point you to the excellent write up at the end of this part. The second part of the challenge was to analyze the PCAP file, the cleartext PCAP file can be found here. 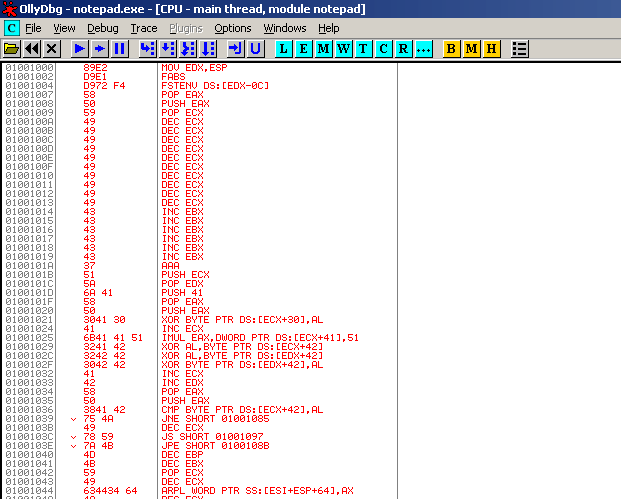 Looking at the PCAP we can see that a request is done in tcp.stream 1, which contained a pretty big hint what it was. If we select the first line and set the “New origin here” (right mouse menu) the shellcode will be ready for execution. Dont forget to set the memory access to full if you run in to errors (Memory Map (Alt-M), select memory segment, right mouse clock, set access–>full), this happens when memory protection is on.